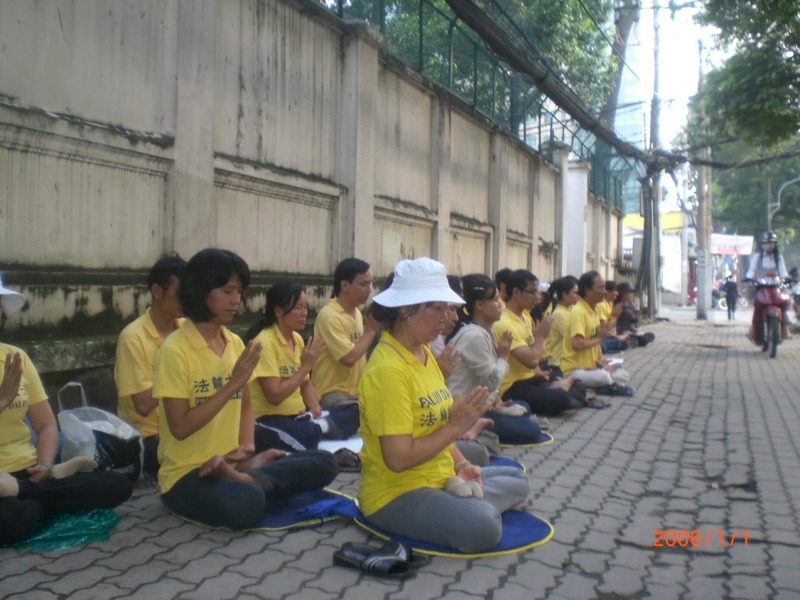 Falun Gong practitioners holding a sit-in in front of the Chinese consulate in Hanoi on October 6. Soon after this photo was taken, Vietnamese authorities forcibly detained over 30 of the participants. New York—The trial of two Falun Gong practitioners in Vietnam, scheduled to take place today, has been postponed. The pair, charged over broadcasting radio programs into China, remain in custody, however, and could be tried at any time. Meanwhile, over 30 Falun Gong practitioners who were holding a quiet sit-in in front of the Chinese consulate in Ho Chi Minh City were detained by the authorities. The two Vietnamese men—Mr. Vu Duc Trung, a 30-year-old CEO of a high-tech company, and his 35-year-old brother-in-law Mr. Le Van Thanh—were scheduled to stand trial in Hanoi on October 6 for broadcasting uncensored radio programs to China following a request from Beijing to crackdown (news). According to sources close to the case, when the pair’s lawyer, witnesses, and other observers arrived at the courthouse, it was suddenly announced that the trial had been postponed. The delay appears to be a reaction to international pressure from human rights groups and foreign diplomats on the Vietnamese government. Reporters without Borders and Freedom House both issued alerts Wednesday criticizing the trial. In April 2011, a similar postponement occurred after international condemnation. The Falun Dafa Information Center urges the international community to continue to call for their immediate and unconditional release, as these two men have been in custody since June 2010. In a related development, on the same morning as the trial’s postponement, at least 30 other Falun Gong practitioners who had been holding a quiet meditative sit-in in front of the Chinese consulate (see photo), were taken into custody by the Vietnamese authorities. According to eyewitnesses, the individuals were forced onto a bus, some violently, and then separated into smaller groups and taken to separate locations. Several practitioners who had been meditating at Le Van Tam park were also detained. Approximately two hours prior to the publication of this press release, most of those detained were released by Vietnamese authorities.